Great replacement for Raydot Bi-Flow Ceiling Inlet! 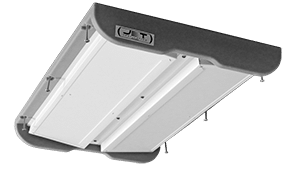 Upgrade your old Raydot Inlets with Double L's RD1200 Raydot Bi-Flow Fresh Air Ceiling Inlet or RD2400 Raydot Bi-Flow Fresh Air Ceiling Inlet. 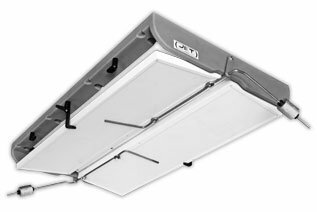 The RD2400 Bi-Flow Ceiling Inlet is a fully insulated 2-way replacement inlet that is great for precise control of fresh air movement. Great for minimum to maximum ventilation, RD2400 Raydot Inlets direct airflow along the ceiling for proper air mixing. Easily retrofit your hog barn and upgrade old Raydot Inlets without needing to reframe! Double L's Raydot Inlets are available as either actuated or counterweighted. 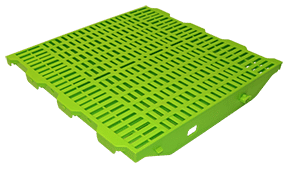 Constructed of a one piece, single molded, corrosion resistant rotomolded housing with frictionless insulated lids on a continuous PVC hinge. The continuous PVC hinge is non-binding and constructed of very durable, noncorrosive, flexible PVC. Gravity or counterweighted inlet automatically closes when fans slow down. The RD2400 Gravity Inlet also has the option to be shut-off or only be partially closed to direct fresh airflow along the ceiling. Each RD2400 Raydot Swine Ceiling Inlet lid is fully insulated to minimize condensation, dripping, or freezing. Great replacement for Raydot Bi-Flow Ceiling Inlet. Fully insulated to minimize condensation, dripping, or freeze-up. New Premier Nursery Floor has a bright lime green color for easy scour detection and cleaning. Heavy-duty hog slat for pigs up to 120 pounds.